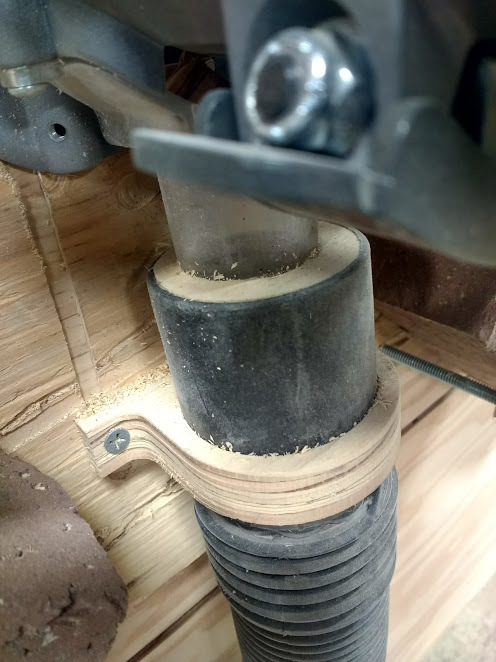 I accidently had been using this 1-1/4 inch dust collector hose which has an adapter to fit the Ridgid router, but when I went to buy a second one I accidently bought the 2-1/2 inch version instead which doesn't include an adapter. Rather than buy an adapter (which didn't work that well anyway) I decided to cut my own. I also added an extra strain relief system which attaches the hose directly to the sled. I've been using it for a couple months now and I've been really happy with it so far. The air flow through the 2-1/2 inch pip is substantially better than it was through the 1-1/4 version, and it has yet to clog. I had to tweak the size of the parts to get the press fit I was looking for. The hose adapter press fits into the end of the suction hose and press fits around the router dust outlet. Because the part is press fitting into a negitive pressure environment it's imporant that it be a snug fit. The strain relief brackt then press fits around the hose itself and attaches to the sled with two 1-1/4 inch long screws. Because plywood is vulnerable to splitting when screwed through the edge it is important to drill and countersink the screw holes before attaching the strain relief. This dust collection strain relief is designed to work with this RIDGID 2-1/2 inch hose but could probably be adapted to other hoses.